Peter has been a professional cartoonist and illustrator for over 20 years entertaining the corporate world and general public with humourous caricatures which capture the person’s essence within 4 minutes. Peter uses a gentle approach to caricaturing so as to attract even the shyest person to indulge in the fun of being drawn. Peter,s style brings out the inner child of each participant as he interacts with his subject. The whole experience is to relax the guests and show them a fun side of themselves in a picture they will cherish. Group involvement is always encouraged to enhance the experience of everyone present. Peter has worked locally, interstate and overseas representing many various companies attracting guests, existing and potential clients utilising his humour and artistic skills at trade shows, conferences, conventions and Christmas functions. Peter’s aim is to uplift peoples’ lives with an entertaining caricature which takes 3-4 minutes, but the experience lasts a lifetime. Peter is very comfortable drawing any person who wishes to be drawn from babies to seniors, males and females regardless of their ethnicity. The caricatures are usually drawn on A4 card. For special occasions Peter can have a B/W caricature drawn of the person/couple and print it onto each card for the guest ‘s caricature. The host/s keep the original caricature. A separate charge for the caricature. Company logos can also be printed onto A4 and A3 cards (for couple caricatures). Caricaturists are emerging as the “essential ingredient” for any party, Corporate event or special occasion and have proven to be a great ice breaker. 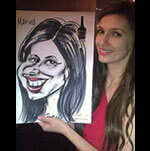 Graeme draws cartoon caricatures of employees at their Corporation‘s event as a souvenir of the occasion. A gift for each staff member to take home and look upon with rememberance. With a humourous nature, professionalism and his love of people, Graeme enhances any event he attends. Whether it be a wedding reception, hens’ party, birthday celebration or anniversary, caricatures add that “something special” to the event. Graeme also specialises in drawing characters for logos, cartoons and advertising campaigns as well as cartoon comic strips. Having been born with an artistic ability Graeme takes pride in all aspects of his work and has over 30 years experience in illustration / cartooning and graphic design. A hugely talented and funny caricaturist who delights audiances everywhere with his amazing personality and funny drawings. Hecan brighten up your events like no other and your guests get a memento of their time spent at your function. 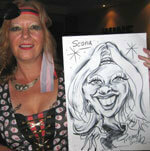 An expert roving caricaturist who draws 25 – 30 caricatures per hour. He achieves a fantastic likeness and offers a 100% MONEY BACK GUARANTEE if your guests are not impressed. 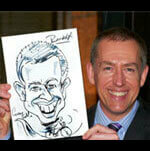 Australia’s Fastest caricaturist.